Pete Johnson, born March 2, 1954, in Peach County, Georgia, is a former college and professional American football running back. He spent eight seasons in the NFL, primarily with the Cincinnati Bengals. Before his NFL career, Johnson played for the Ohio State Buckeyes. 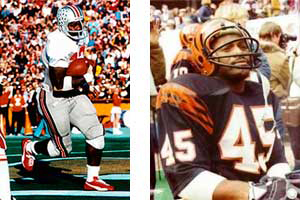 Johnson played fullback for Ohio State from 1973 through 1976. He finished his career at Ohio State with 2,308 rushing yards and a school record 58 touchdowns. In 2000, Johnson was selected for the Ohio State Football All-Century Team. On September 8th, 2007, Johnson was inducted into Ohio State’s Athletics Hall of Fame. A superb rusher and blocker, Johnson excelled at running back for the Bengals. As the team’s leading rusher for all seven seasons, he also scored 12 or more rushing touchdowns in three different seasons. In 1984, Johnson was traded to the Chargers. He left Cincinnati as their all-time leader in rushing yards (5,421), touchdowns (70), and their second all-time leading scorer with 420 points. Johnson spent the first three games of the 1984 season with the Chargers and spent the final thirteen games with Miami before retiring after the season ended. In his eight NFL seasons, Johnson rushed for 5,626 yards, caught 175 passes for 1,334 yards, and scored 82 touchdowns.